Delicately sweet yet crunchy and delicious cashew nut is packed with antioxidants, energy, minerals and vitamins with many of the usual letters. 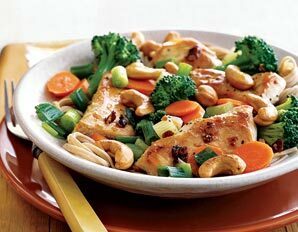 Cashew is one of the popular ingredients in sweet as well savoury dishes worldwide as well as just a handy snack. otanically, cashew is an average size tropical evergreen tree belonging in the Anacardiaceae family, in the genus: Anacardium. Scientific name: Anacardium occidentale. 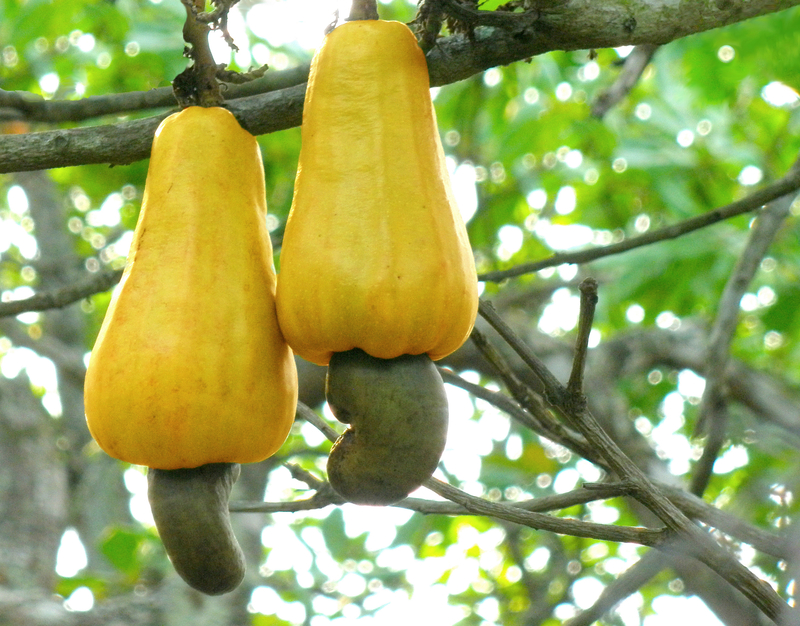 The cashew tree is native to Brazil’s Amazon rain forest. It spread all over the world by Portuguese explorers and today, it is cultivated commercially in Australia, Brazil, Vietnam, India and in many countries. Its exterior shell composes a phenolic resin, urushiol, which is a potent caustic skin irritant toxin. In the processing units, this outer shell is roasted in order to destroy urushiol resin, and only then its edible cashew kernel is extracted. Cashew nut measures about an inch in length, 1/2 inches in diameter, and kidney or bean shape, with smooth curvy pointed tip. Each nut splits into two equal halves as in legumes. Cashews feature cream white colour with the firm yet delicate texture and smooth surface. Cashews are high in calories. 100 g of nuts provide 553 calories. They are packed with soluble dietary fibre, vitamins, minerals and numerous health-promoting phyto-chemicals that help protect us from diseases and cancers. They are rich in “heart-friendly” monounsaturated-fatty acids like oleic, and palmitoleic acids. These essential fatty acids help lower harmful LDL-cholesterol while increasing good HDL cholesterol. Research studies suggest that Mediterranean diet, which is rich in monounsaturated fatty acids help to prevent coronary artery disease and strokes by favouring healthy blood lipid profile. Cashew nuts are abundant source of essential minerals. Minerals, especially manganese, potassium, copper, iron, magnesium, zinc, and selenium are concentrated in these nuts. A handful of cashew nuts a day in the diet would provide enough of these minerals and may help prevent deficiency diseases. Selenium is an important micronutrient, which functions as a co-factor for antioxidant enzymes such as Glutathione peroxidases, one of the most powerful antioxidants in the body. Copper is a cofactor for many vital enzymes, including cytochrome c-oxidase and superoxide dismutase (other minerals function as co-factors for this enzyme are manganese and zinc). Zinc is a co-factor for many enzymes that regulate growth and development, gonadal function, digestion, and DNA (nucleic acid) synthesis. Cashews are also good in many essential vitamins such as pantothenic acid (vitamin B5), pyridoxine (vitamin B-6), riboflavin, and thiamine (vitamin B-1). 100 g nuts provide 0.147 mg or 32% of daily-recommended levels of pyridoxine. Pyridoxine reduces the risk of homocystinuria, and sideroblastic anaemia. Niacin helps prevent “pellagra” or dermatitis. Additionally, these vitamins are essential for metabolism of protein, fat, and carbohydrates at the cellular level. Further, the nuts are also carry a small amount of zea-xanthin, an important pigment flavonoid antioxidant, which selectively absorbed into the retinal macula lutea in the eyes. It is thought to provide antioxidant and protective UV ray filtering functions and helps prevent age-related macular degeneration (ARMD) in the elderly. Cashew nuts are available in the market year round as they can be sourced and stored from numerous countries. In the stores, only shelled cashew kernels are sold since the shell contains phenolic resin, urushiol, which is a potent skin irritant toxin. In the stores, one may come across raw, salted, sweetened or candied cashews. Buy shelled nuts that feature bright cream-white, compact, uniform in size and feel heavy in hand. They should be free from cracks, mould, and spots and free of rancid smell. At home, store cashew kernels inside an airtight container and keep in the refrigerator in order to avoid them turn rancid. Under ideal conditions, fresh nuts should last for 5-6 months. Cashews have crunchy, buttery texture with a pleasant sweet fruity aroma. Cashews can be enjoyed as a snack as they are, salted or sweetened. Cashews are nutty yet pleasantly sweet in taste. They are relished as a garnish in various kinds of sweets and desserts. Cashews, along with almonds and other dry fruits, are being used in savoury rice dishes hyderbadi-biriyani, rice-pulao…etc, and in curry (kaaju-shahi-paneer) preparations in Indian, Persian, Pakistani, and Middle-Eastern regions. Split or crushed cashew along with almonds, pistachio is often sprinkled over desserts, particularly sundaes, and other confectionary to enhance the flavour. The nuts are widely used in confectionery, as an addition to biscuits, sweets and cakes. 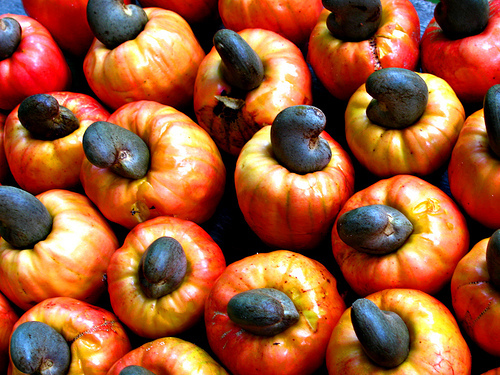 “Cashew apples” are among popular fruits; eaten on their own in many regions around the world. They are also being used to prepare healthy drinks. 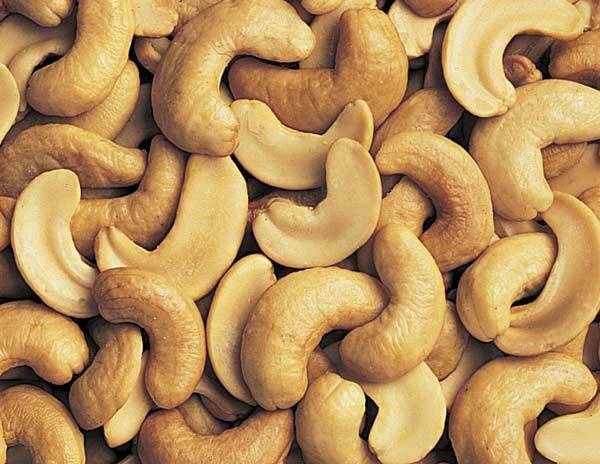 Cashew nut allergy is a common hypersensitivity condition in some individuals, especially in the children. The reaction symptoms may range from simple skin itching (hives) to severe form of anaphylactic manifestations, including breathing difficulty, pain abdomen, vomiting, and diarrhoea. The allergic manifestations are due to chemical compound anacardic acid (urushiol) that is present in cashew apples, shells, and nuts. Cross-reactions may also occur with some other nuts and fruits of Anacardiaceae family such as mango, pistachio, etc. Individuals with known allergic reactions to cashew nut and fruit may observe caution while eating them.